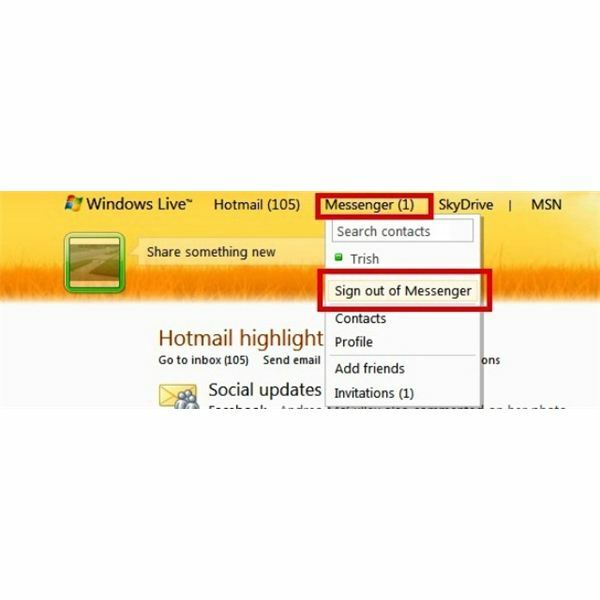 Even if you are an avid Windows Live Messenger user, there are times when disabling it is beneficial. For instance, if you are giving a presentation or holding an important video conference call, a Messenger popup may seem less than professional. There might be other circumstances in which you want to leave Messenger running but don't want to hear distracting notification sounds. Similarly, you may want to choose when to start the application as opposed to having it run whenever you start your computer. Finally, you might have decided that you have no use for the program and want to permanently remove it from your system. No matter your reasons, you can select the method that best suits your needs to turn off Windows Live Messenger. also click the arrow beside your name and select Show the Menu Bar. Once the toolbar is visible, go to Tools and select Options. To turn off sounds, select Sounds in the left pane of the window and then select the Mute All Sounds check box. You can also opt to disable specific types of sounds by selecting the related action and choosing Don't Play a Sound. Click Apply to save your changes. To disable notifications that pop up when you receive an instant message, a friend signs in to Messenger and so forth, go to Notifications in the left pane of the window. Clear the check box for each type of notification that you want to disable. To turn off other types of notifications, such as social networking updates, click on the related link and select from the options provided. 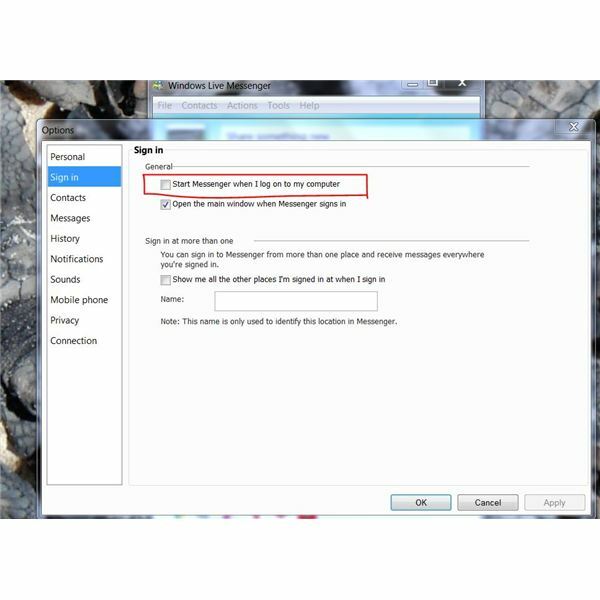 If Windows Live Messenger starts running each time you turn on your computer, you can change this setting. This way, you can still easily open the application from your Start menu whenever you want to use it without it running when you don't want it. The simplest method is to go to the Tools menu (again, if you do not see the toolbar, simply press the Alt key) and select Options. Select Sign In in the left pane of the window. Under General, clear the Start Messenger When I Log on to My Computer check box and click OK. If this method fails to work for you, disabling it from your list of startup programs will take care of it. Perhaps you simply want to take a break from Messenger, turning it completely off for a while. You thought you had closed the application by clicking the little red "x" up in the corner, but you suddenly received a message notification or you realized it was still present in your task bar. 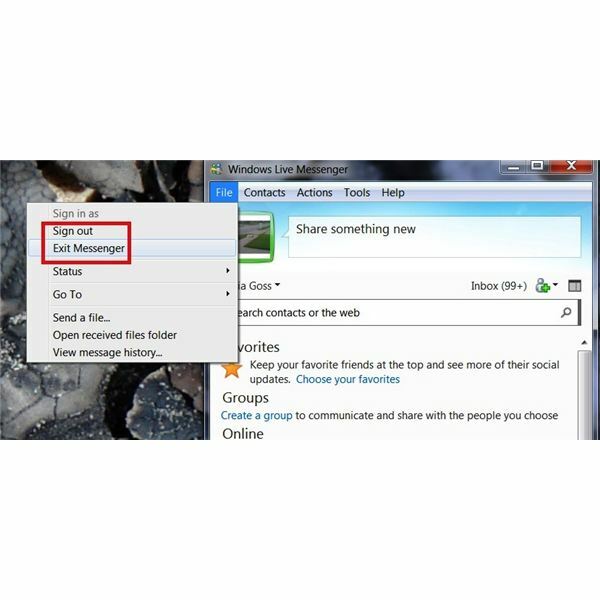 To turn off Windows Live Messenger completely without making any changes to the program, go to the File menu in the toolbar and select Exit Messenger. Alternatively, you can click on the arrow beside your name and select Exit Messenger as well. When you want to use the program once more, simply open it from your Programs list or a desktop shortcut. 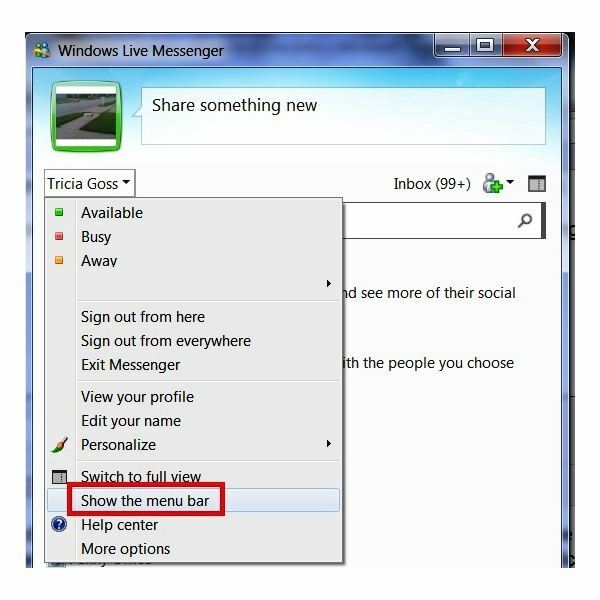 In addition, you can leave the Messenger window open and sign out so that you do not receive any notifications. Go to the File menu in the toolbar and select Sign Out. You can also click on the arrow beside your name and select Sign Out from Here or Sign Out from Everywhere if you are logged in on another computer or device. A third way to sign out of Messenger until you want to use it again is online. Log in to your Windows Live Hotmail account. From the main mail window, point to Messenger at the top of the page and select Sign Out of Messenger. You can sign back in using this option as well. If none of the previous options solves your issue and you simply want to remove Windows Live Messenger from your computer altogether, uninstalling it is easy to do. Simply go to Add or Remove Programs from the Control Panel, or type Remove Program into the Search box on the Start menu in Windows 7 or Vista and select Add or Remove Programs. 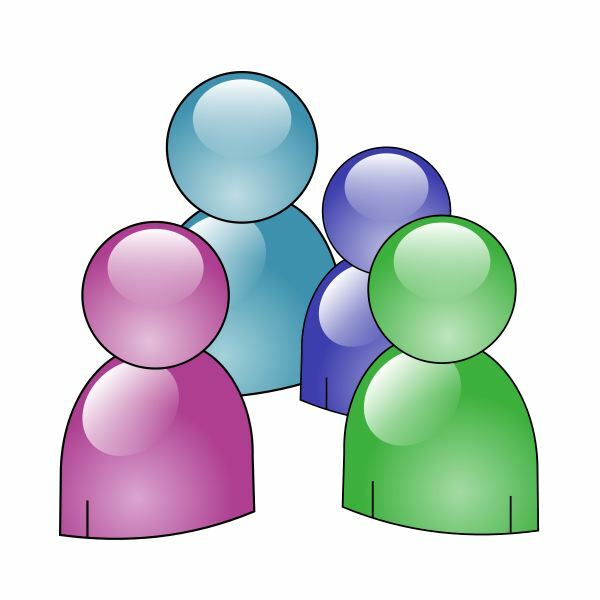 If you do not see Windows Live Messenger, select Windows Live Essentials from the list of currently installed programs. Click on Uninstall/Change. 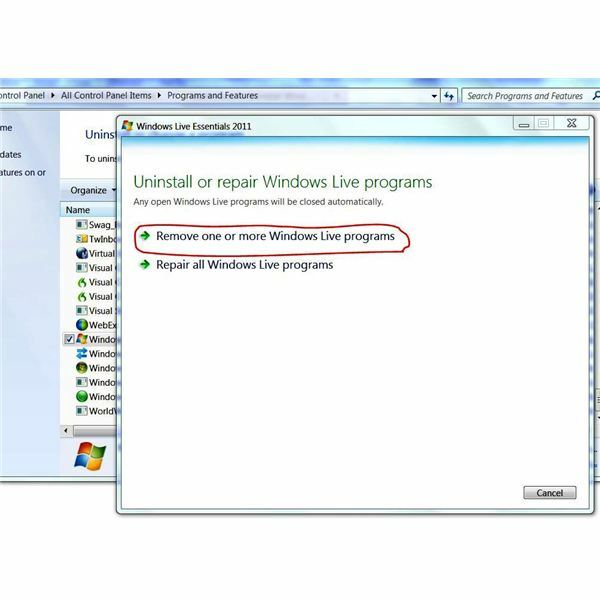 Select Remove One or More Windows Live Programs, choose Messenger and click the Uninstall button. Wait while the program is removed. Of course, if you change your mind you can always install Windows Live Messenger once more.